G7102XXUANE2 Android 4.3 Jelly Bean Firmware Last Updated on 16-May-2014. Samsung Galaxy Grand 2 Duos SM-G7102 recently received the latest XXUANE2 Android 4.3 Jelly Bean official firmware update. Samsung started rolling out an OTA update about the firmware. The latest firmware build version number is G7102XXUANE2. The Galaxy Grand 2 Duos was released with Android 4.3 Jelly Bean out of the box and already get many official firmware update. Here we have the latest available official firmware for the device. If you own the Smartphone and not yet updated this latest firmware, then update the same using our simple tutorial below. The below guide will help you to download and install the G7102XXUANE2 Android 4.3 Jelly Bean firmware manually through Odin. If you already updated the G7102XXUANE2 firmware and looking for an easy to follow method to root the firmware, then follow this guide- Root G7102XXUANE2 Android 4.3 Stock Firmware On Galaxy Grand 2 Duos SM-G7102- Simple Tutorial. As the Galaxy Grand 2 Duos G7102 already running on the Android 4.3 Jelly Bean, you can only expect few bug fixes and performance enhancement with this latest Android 4.3 Jelly Bean firmware update. 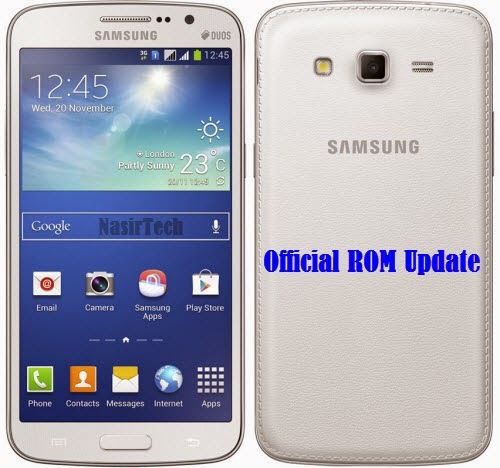 So, want to update your Galaxy Grand 2 Duos G7102 to the latest G7102XXUANE2 Android 4.3 Jelly Bean firmware? To install in official way, either you can go for OTA update from Settings-About-Software Update or download firmware through the Samsung Kies utility. However, most of us prefer manual way to update official firmware. So, in this article you’ll find step by step manual guide to update the latest Android 4.3 XXUANE2 firmware on your Galaxy Grand 2 Duos G7102 through Odin. All the above pre-requisites are very important and must follow before proceed to installation guide. Hope you get all the above points. Now, go through the below tutorial to install Android 4.3 G7102XXUANE2 official firmware on Galaxy Grand 2 Duos G7102. Congrats! you have completed the tutorial to update Android 4.3 Jelly Bean official firmware on Galaxy Grand 2 Duos SM-G7102. Hope you successfully done the update process. If you followed everything as mentioned in the above tutorial, then your Galaxy Grand 2 Duos should now running on the latest Android 4.3 Jelly Bean build version XXUANE2. You can confirm the firmware update details from Settings-About Phone. If you stuck in any point or find any issue with the download link, then feel free to contact with us using the comment form below. I have completed the Firmware update through 3G connection on Phone. But no difference i find in UI of the phone. I see the new Build version. So could you please help me with the advantage we would get by this Firmware Update? I have 4.4.2 ( INDIA ) and tried to rollback to 4.3 by following a tutorial on youtube but resulted in failure. Then I fully rooted my SM-G7102 with Super SU access and CWM but no success. Could you please post a tutorial on how to revert back to 4.3 from 4.4.2? ?